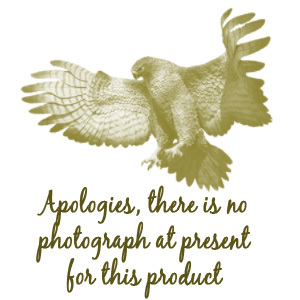 A slightly smaller, single sided version available for display falconers, children and non-hunters who require less space in a bag. Width is 13" and height is 14". These bags have often been copied but NEVER bettered. Please note: this bag does NOT include a bag strap, these are sold as a separate item. 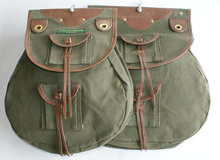 Double sided bag in hunting green with leather faced pocket to front flap and knife pouch. Very well constructed and made to match our Nubuck gloves. Single sided suede hip bag in hunting green (plain green in picture) but occasionally has leather faced pocket to front flap. Very well constructed and also made to match our gloves. Enlarge Photograph Made in washable olive green fabric, this is a new generation of hawking bags. The wrap around style incorporates 2 large zipped pockets plus front pocket, knife pocket, swivel pocket, washable meat pocket, rear quarry pocket, D rings, built-in padded strap and separate tab with eyelets for jesses or leash. Sadly they no longer come with kitchen sink or built-in microwave oven! 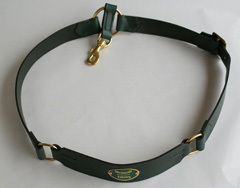 Now described as; Black, adjustable leather strap (variously described on other websites inaccurately as being made of fine English harness leather and other such daft claims) when in fact they are a decent basic leather strap of questionable parentage but they are heavyweight leather that will do the job and are priced according to their pedigree! Photo to be updated if I ever get time to do it. 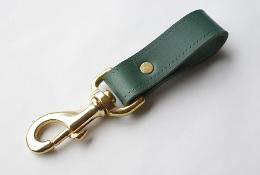 Enlarge Photograph Cut from black 4mm harness leather and fitted with a substantial brass or nickel trigger hook for many years of wear. With enormous double zipped, ventilated rear quarry pocket, two HUGE side pockets, two HUGE zipped side pockets and velcro fastened food pouch that can be moved to left or right pocket. In dark green, machine washable, waterproof 600 denier nylon (looks and feels like cordura) with adjustable, black, shoulder and chest straps and two fixed D rings. These truly are a top quality product and are VERY comfortable. Wear it once and you'll 'bin' your beloved hawking bag forever....unless it's one of mine, in which case it's probably got years left in it! These vests are very adjustable, and therefore one size fits all..in theory! Enlarge Photograph Protection from your bird while you take a leak with your hungry bird watching from above! 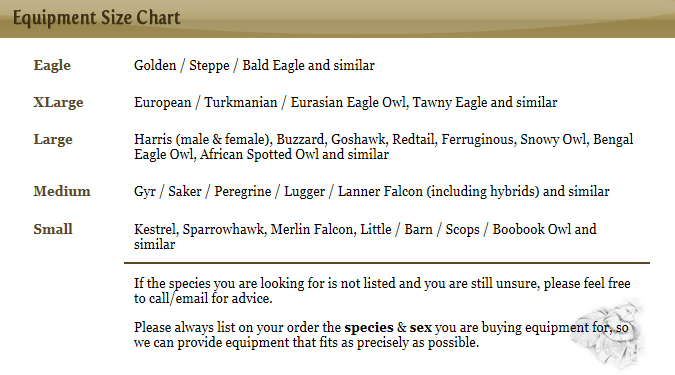 Only available in falconers sizes 9� / 10� / 11� / 12� Please send outline drawing!��.only kidding�� really! Some people like to call it a gilet but since we're British.........it's a waistcoat to you and me. Nicely put together with Cordura and leather, this waistcoat has more pockets than a roomful of snooker tables. (allow here for some creative exaggeration!) It is adjustable by way of straps to either side ..........and did I mention the pockets? So many pockets! The two large front pockets have zipped / ventilated quarry pockets behind them.